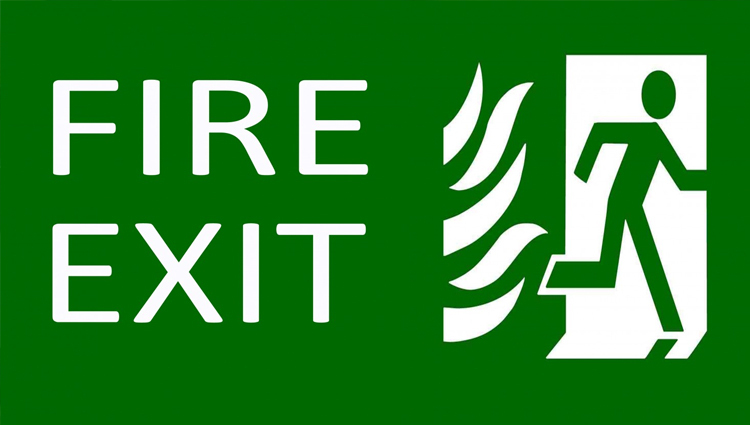 New research focuses on improving exit times by placing obstacles near emergency exits. WASHINGTON -- Most fire codes require that the pathway to an emergency exit be kept wide open, but according to researchers in Japan, placing an obstruction next to an exit may actually help crowds of people to get out of a room more efficiently. "We found that we can evacuate faster if we put an obstacle at the suitable position in front of the exit," said Daichi Yanagisawa, who lead the study from the University of Tokyo in Japan. . The researchers started their study by having large simulated crowds of people bottleneck around small exits, and then introduced obstacles that everyone would have to avoid in order to reach the exit. Most of the time, the obstacles reduced the number of people able to exit per minute. Surprisingly, they found more people could escape in less time if an obstacle was placed about 30 degrees to either the right or left side of an exit door. "Contrary to our intuition, the obstruction by the obstacle increases the pedestrian outflow in a certain case, since it decreases conflicts among pedestrians," Yanagisawa said. Researchers found that having an inanimate pole take up the space of a person reduced the number of time-consuming conflicts between people near the exit. Similarly, the pole's placement slightly off to one side of the doorway reduced the time it took for a person coming from the other direction to turn toward the exit. To test their results, the researchers went to the studio of a local TV station and watched 50 volunteers exit through a narrow door. They found that the crowd of real people closely mirrored the researcher's previous computer predictions. Likewise, when they placed a pole to one side of the exit, the people were able to exit faster than when there was no obstruction at all. Yanagisawa's team was the first to put this into mathematical terms. "I believe that our work will help design better and more efficient fire escapes since our model gives us the value of pedestrian outflows based on both theoretical and experimental study," Yanagisawa said. During the experiment, the team also found that people exiting in a single-file line were by far the most efficient. Yanagisawa said that the next step is to program models of people intelligent enough to self-organize into a line.